A friend recently reminded me that Shaun of the Dead was a movie that existed and that I should probably watch it again because I couldn't remember it. 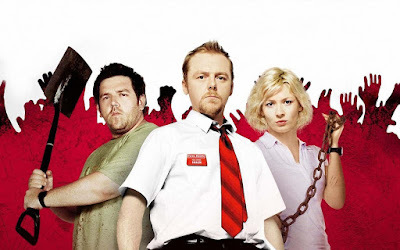 Shaun of the Dead is a weird Rom Zom Com. A Rom Com with Zombies in it. It's not really a horror movie, which is good since I don't really like horror movies, but it's not a straight up Rom Com either. It's definitely in the vein of the Hot Fuzz and The World's End which are part of this (very) loose trilogy of movies. I liked it a lot more than I remembered from my first watch. I think going into knowing what it was helped a lot. The first time I basically watched the movie knowing nothing about it. This time I could just appreciate it for what it is instead of what I thought it might be.